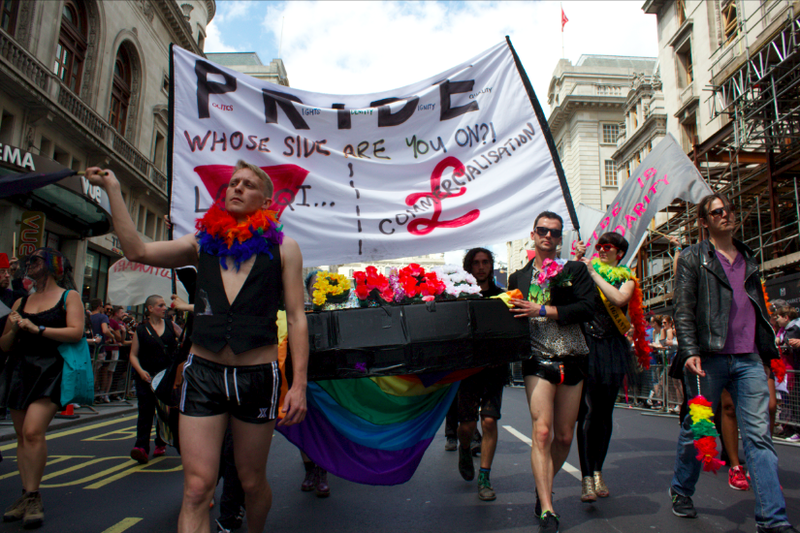 A coalition of individuals belonging to LGBTQI communities and holding a ‘Pride Funeral’ procession, broke through barriers at Oxford Circus to lead this year’s London LGBT Pride Parade. Coffin bearers, flag wavers, banner holders, an undertaker and a samba band sounding a slow funereal beat, all resisted security and stewards who attempted to physically remove them from the street. 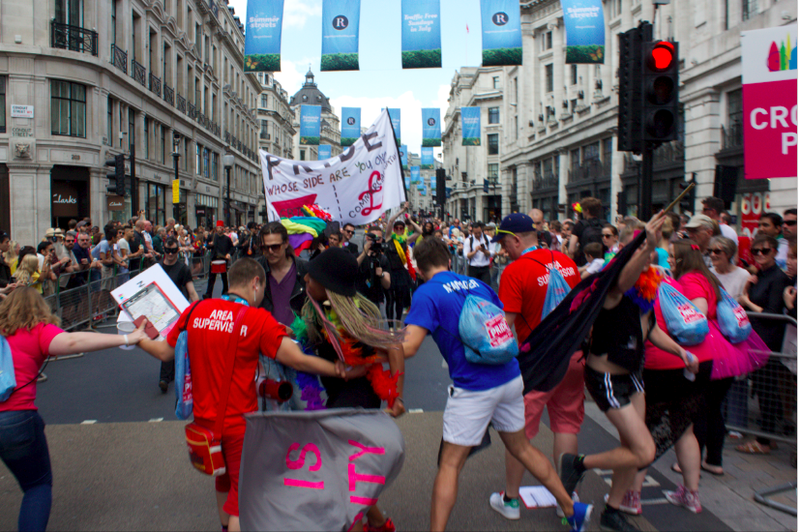 With flags baring messages of solidarity, politics, freedom and anti-commercialisation, RIP Pride activists solemnly strode the route section from Oxford Circus toward Embankment, until its final destination at the foot of Whitehall. 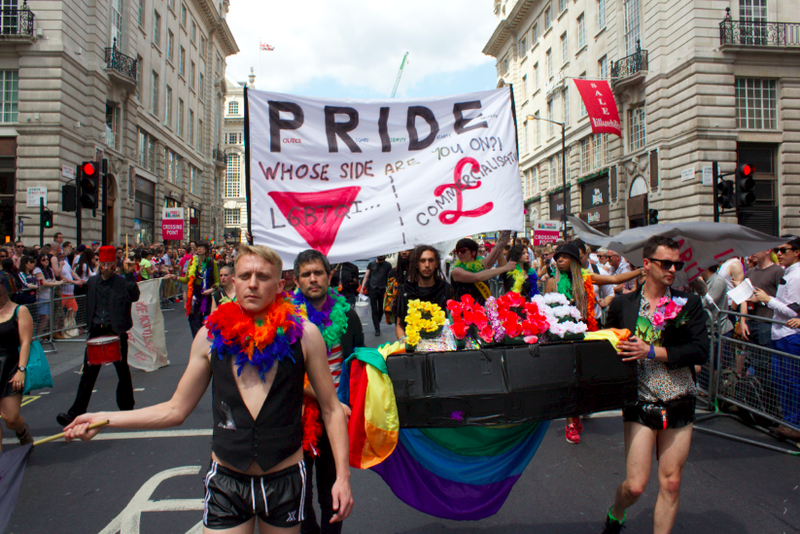 The group’s action was one of sombre defiance against the fee that Pride organisers now charge those who want a place on the historically significant LGBT parade. Anger at the annual parade reached unprecedented levels this year, when news of UKIP’s inclusion in queer festivities were originally confirmed. This involved a key position for UKIP at the front of the parade. The queer community outcry for UKIP removal, resulted in Pride organisers disinviting them, citing ‘health and safety concerns’ rather than recognising the grievances of those who raised concerns. One of the organisers later went on to call members of the community concerned by the inclusion of the far-right party, ‘hypocrites’ (1). 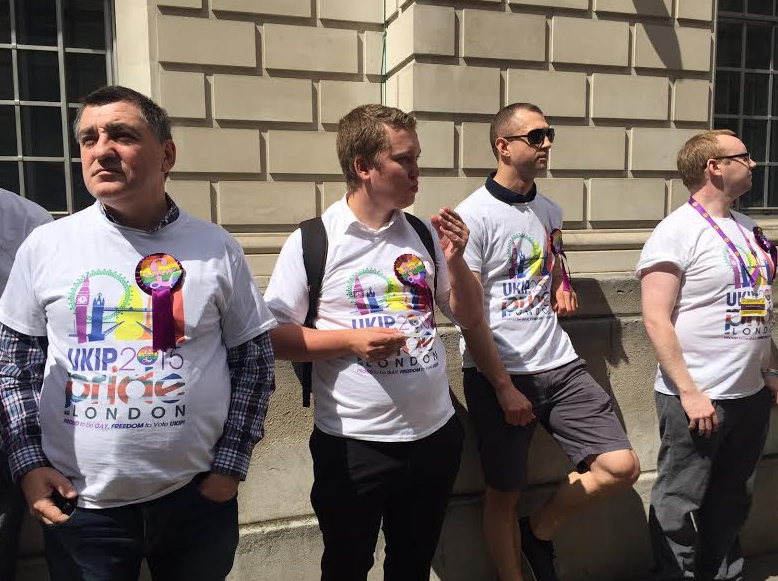 However, it transpired that a group of men holding UKIP placards were one of the first groups marching on the parade, closely following Barclays (2). RIP Pride mourners were reading a Pride eulogy around their grounded Pride coffin when they spotted UKIP marching near the front. Those in the funeral procession confronted UKIP waving their flags and chanting, and this ultimately lead to UKIP supporters leaving the scene, in the face of growing hostility. Dan Glass a mourner at ‘RIP Pride’ said: “It was so great to see Pride return to it’s roots as a protest rather than just a parade (6). Pride should have strong political principles with equality for everyone at it’s heart not just big business or any organisation who wishes to milk the LGBTQI community dry. Our demand is that the organisation of Pride becomes democratic: decision-making power should be taken away from the current unrepresentative, largely corporate Board and an LGBTQIA assembly should be established, to decide the theme and direction for Pride in 2016 and onwards.